The holidays are on the way, and here’s the perfect gift idea for anyone who loves to bake – festive Christmas Ornament Cakes!! Each year my husband’s family gets together for a holiday dinner potluck party. This year I am trying something a bit more unique than your typical holiday cake. Using my new Good Cook Sweet Creations 3D Ornaments baking pan, I’ll be bringing some adorable and delicious Christmas Ornament Cakes! This tasty Christmas Ornament Cakes are perfect for holiday parties and special holiday treats. They also make a wonderful homemade gift! Spray both of the Christmas Ornament Cake pans with cooking spray. In one bowl, sift together the flour, baking powder and salt, then set to the side. Next, beat in the egg yolks one at a time. Now stir in the vanilla extract. Beat in the flour mixture alternating with the milk, and mixing until just combined. 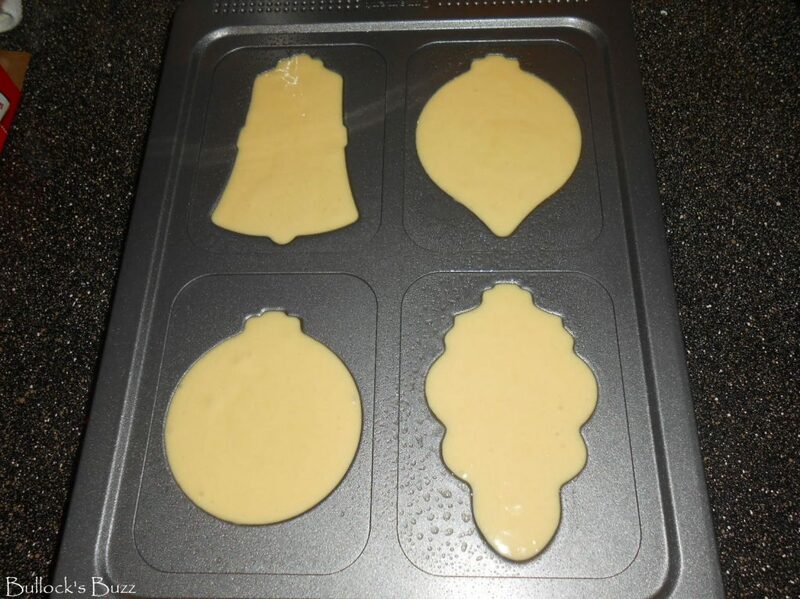 Pour batter into the bottom ornament cake pan. Be sure to fill each impression to the top. Now place the second pan directly on top of the first. Bake in the preheated oven for 25 to 30 minutes, or until an inserted toothpick comes out clean. There are little holes in each pan so you can do this. Once the cakes are completely cooked, remove any excess cake that may have come out of the holes and remove the top pan. Wait about 15 minutes, then carefully remove the Christmas Ornament Cakes from the bottom pan and continue to cool on a rack. Once the cakes are completely cooled, decorate as you would like. 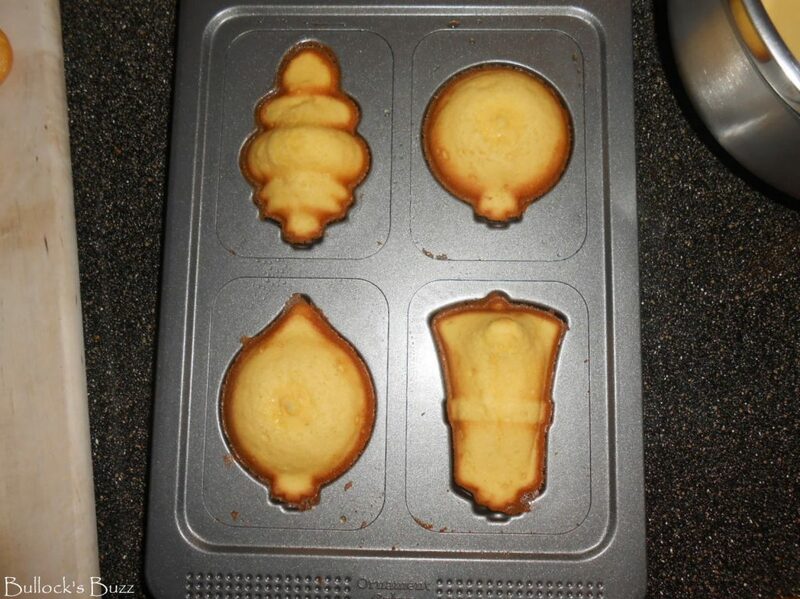 The Good Cook holiday ornament cake pan makes it so easy to bake perfectly shaped 3D ornament cakes. Your family and friends will think you spent hours creating these cute cakes. 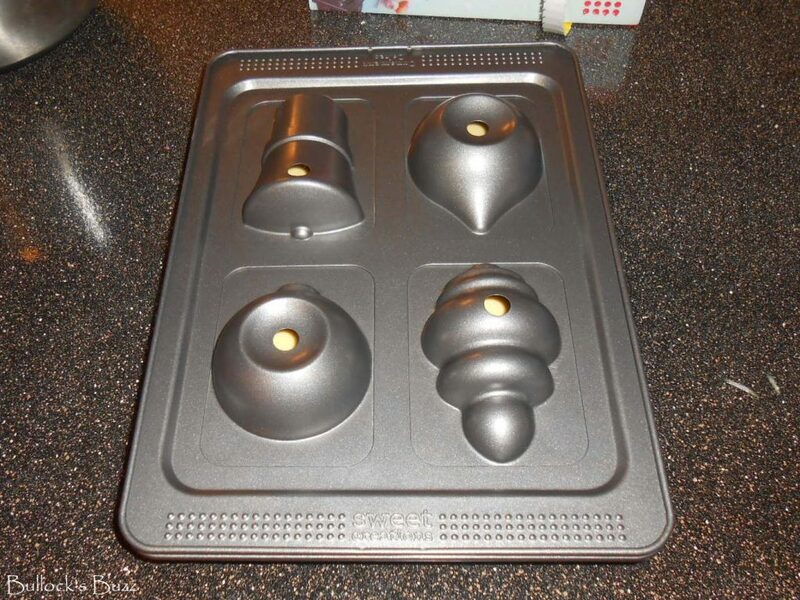 The set comes with a top and a bottom pan, and has four different shaped ornament molds. Each mold also has different detailing which transfers over to the finished cakes, making each one beautifully unique. Using the pans is very easy. They fit securely together, and the top pan has holes so you can easily insert a toothpick to see if the cakes are done. Plus, the non-stick pans are durable and very easy to clean. The Good Cook Cake Decorator Bag made decorating my Christmas Ornament Cakes a breeze! The 6 piece set comes with everything you need including a durable, reusable icing bag and 5 different tips. You’ll have everything you need for decorating cakes, cupcakes, cookies and more. I have given a homemade gift basket. It was a nice gift! I love to make homemade gift baskets during Christmas. Everyone loves them. How awesome! Your 3D cake ornaments look amazing! I make homemade gifts every year… usually in addition to a purchased gift. My favorite items to make are hand-knit socks. It’s crazy and awesome how excited people will get over socks! I LOVE the fact that I will have a cool and unique baked good to share with my friends and neighbors this holiday season – thanks for showing me this!! For the giveaway: My favorite homemade gifts are earrings from my sis, a scarf from another sis, and a decorated box from my daughter! I made homemade chocolate mint cookies and put them in festive bags. i paint personalized christmas ornaments! I love giving them for gifts. Every year my Step-Dad’s Sister sends us her amazing homemade salsa. Definitely one of my favorite parts of Christmas. I love those pans. They would be a great addition to my holiday baking. Every Christmas my sister sends us a huge assortment of homemade cookies. She gets pretty creative and makes things I have never seen before. We give a lot of banana bread every year for christmas! just discovered your page and love it! Hello and welcome! Thank you! Check back often as I have tons of great gift ideas for the holidays, giveaways, recipes, crafts and more coming soon!